One common criticism amongst sceptical observers of cryptocurrencies is that cryptos are Ponzi schemes. The stories of massive returns and images of twenty year-olds driving Lamborghinis can make the cryptocurrency market appear as if it’s a get rich quick scheme. Add to that news stories of Ponzi schemes operating within the cryptocurrency community, and it’s easy to see how some bystanders may think that cryptos are Ponzis. A Ponzi scheme is a fraudulent investment scam that pays existing investors out of money invested by new investors, giving the appearance of earnings and profits where there are none. Ponzi schemes usually offer high rates of return with little or no risk to investors. Cryptocurrencies are bearer assets, so generally speaking, by definition they cannot be Ponzi schemes because they don’t offer a financial return to the holder. Bearer assets such as gold coins or cash do not pay any interest, and cryptocurrencies, if held safely by the owner, operate in much the same way. However, the answer to whether cryptos are Ponzi schemes is not as clear cut as this. Because a sizeable portion of crypto investors, particularly uneducated participants in the crypto space, store their crypto assets on exchanges, this opens up the potential for Ponzi style activities to occur within the cryptocurrency community. Once a bearer asset is deposited into an exchange or pooled into some sort of investment, that entity can run a Ponzi style business model. To illustrate this point, picture a one hundred dollar bill for example. Holding the note pays no interest to the bearer, but once deposited into an investment vehicle, it now offers a return on the capital, but also carries with it counter party risk and potential involvement in a Ponzi scheme. In the cryptocurrency space, exchanges are supposed to operate on a full reserve system, meaning that every crypto deposit is safely stored on a one to one basis. For example, for every Bitcoin on deposit, the exchange holds a Bitcoin in their wallet. But suppose the operators of the exchange siphon (steal) half of everyone’s holdings. Unless over half the crypto deposits are withdrawn from the exchange at the same time, the exchange will always have enough crypto on deposit to fund the withdrawals and the clients are none the wiser. Equally as bad, suppose an exchange is hacked of its cryptocurrency holdings, creating a situation where it now has more liabilities to pay its depositors than there are crypto currency reserves. This now creates a fractionally reserved system which can go undetected until there is a ‘run on the bank’. But is a fractionally reserved exchange a Ponzi scheme? Technically no, but much of the same traits that are present in a Ponzi scheme occur in a fractionally reserved system because withdrawals are paid for by the deposits of others. Once an fractionally reserved exchange is overwhelmed by withdrawals, it runs out of funds to pay its clients and collapses in on itself. Events like this lead onlookers and the media to state that cryptocurrencies are Ponzi schemes. Aside from exchanges, the cryptocurrency space is also comprised of investment vehicles, such as mining pools, which also have the potential to run Ponzi style business models. A mining pool is an entity where investors buy into a share of a cryptocurrency mining operation which in turn offers a share of the mine’s proceeds. The initial investment is usually said to be spent on computer hardware which will contribute to mining cryptocurrencies, with the proceeds being divided evenly based on the mining equipment’s hashing power. There are several legitimate mining pools in the crypto space which purchase, run and maintain computer mining hardware on behalf of its participants. However, similar to a classic Ponzi scheme, mining pools usually offer high rates of return which opens up the possibility of generating these returns by using the deposits of new investors rather than through the mining of cryptocurrencies. Ponzi schemes in the cryptocurrency space can also exist in the form of an altcoin. The most recent cryptocurrency to be outed as a blatant Ponzi scheme is Bitconnect (BCC). Until its collapse earlier this year, Bitconnect was a high yielding cryptocurrency platform which promised investors a 1% daily return on their crypto deposits. Needless to say, the returns offered by Bitconnect were unsustainable, and the altcoin was revealed to be a Ponzi scheme leaving thousands of investors out of pocket, and out of luck. As a side note, it’s interesting to calculate that a modest $10,000 investment compounded at 1% daily over 10 years would return the investor $36.5 million! Tether (USDT) is another altcoin which may also prove to have issues in the future. Tether is a cryptocurrency token created by crypto exchange Bitfinex, and is claimed by its creators to be backed one to one with the US Dollar. The Tether token serves the important function of facilitating transactions between cryptocurrency exchanges with a rate fixed to the US dollar, allowing traders to take advantage of arbitrage opportunities without resorting to bank wires. Because Tether is supposedly fully backed by US Dollars, it has recently also become a token where investors can temporarily park their cryptocurrency value in a US Dollar denominated vehicle without having to cash out into the legacy banking system. Unlike Bitconnect, Tether does not offer any interest to its holders, but it may have the same fractional reserve issues inherent with a cryptocurrency exchange. Again, a fractionally reserved system is technically not a Ponzi scheme, but the result to depositors in the event of a collapse is very much the same. So are cryptocurrencies Ponzi schemes? With the exception of Bitconnect and possibly Tether, the vast majority of cryptos are not. 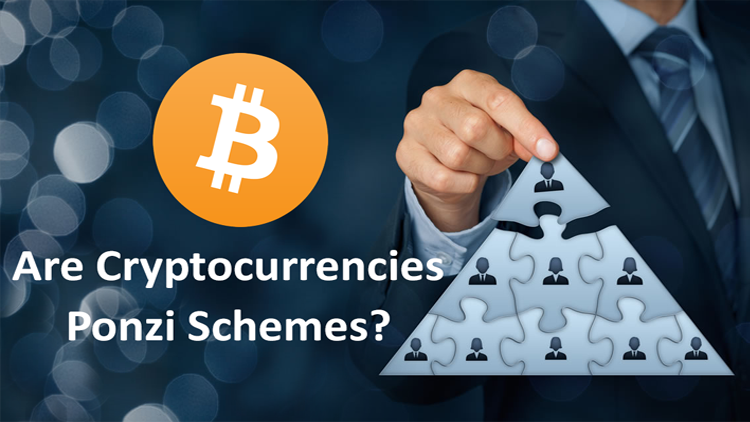 However, businesses which operate as Ponzi schemes can exist within the cryptocurrency ecosystem. This is not to say that some cryptocurrencies will not crash and burn in spectacular fashion based on other factors, but in the realm of Ponzi schemes, most cryptocurrencies are not Ponzis.